Som Tum is one of the most well-known dishes from the Isan province in the north-eastern region of Thailand. Traditionally, it consists of shredded papaya, tomatoes, long beans, and a variety of toppings such as crab, salted egg or anchovies. It forms a kind of sweet and sour salad that can get pretty spicy. This dish is a staple for the majority of Thai people, and they eat it for almost any occasion, and is also as a side dish for their meals. One thing great about this dish is that you can order different flavours and share them. 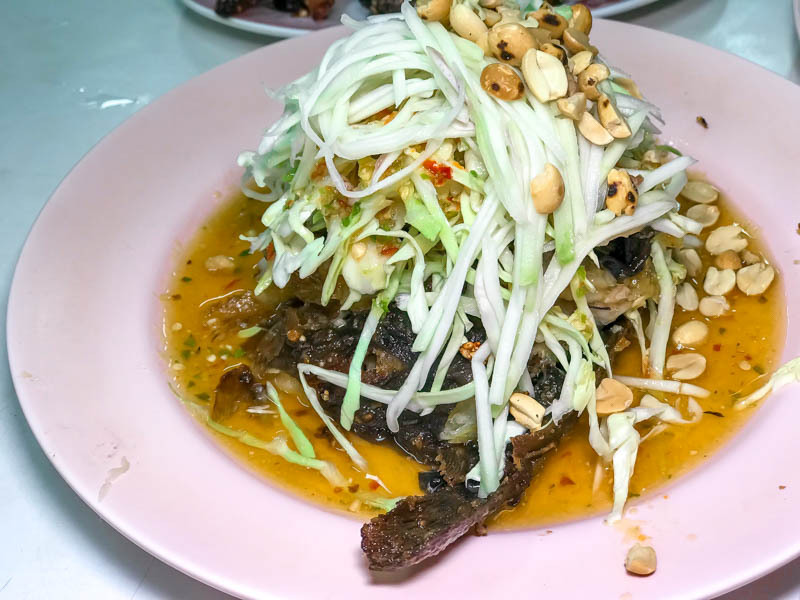 Most shops specializing in Som Tum whip out this dish along with other sides such as grilled or fried pork neck, chicken, sticky rice and pork bone soups. You can be sure to get a pretty filling meal from these shops. 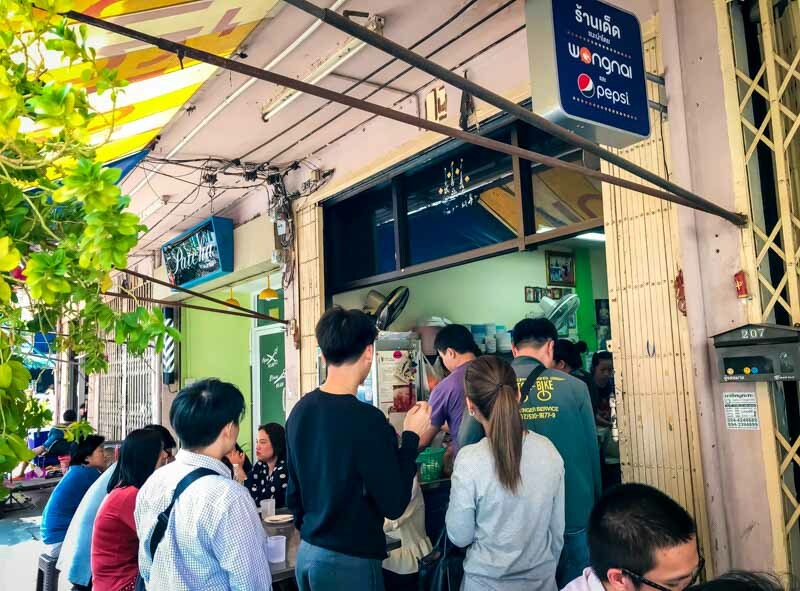 While most Som Tum shops in the malls and tourist areas are usually more expensive and will lose out in terms of taste, Som Tum Jae Daeng is one that caters very specifically to locals around the Sam Yan area. We started with the Som Tum With Salted Egg (THB50, approx. S$2), which comes in three different levels of spiciness. I would definitely suggest starting off with the lowest level unless you are a chilli lover. Each plate of Som Tum is really affordable, so be sure to order as many flavours as you can! The salted egg added pockets of saltiness with every bite, and you will immediately know why it is so well-loved. The Catfish Salad (THB70, approx. S$3) dish that many locals love and the reason is pretty obvious. 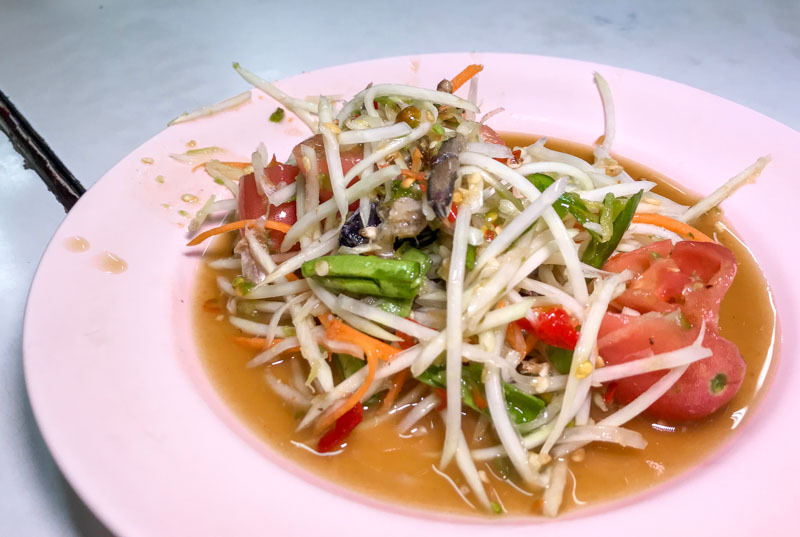 The crisp shredded papaya salad was drenched in spicy and tangy dressing. Beneath all that is a mountain of deep-fried catfish that you’ll want to gobble down. 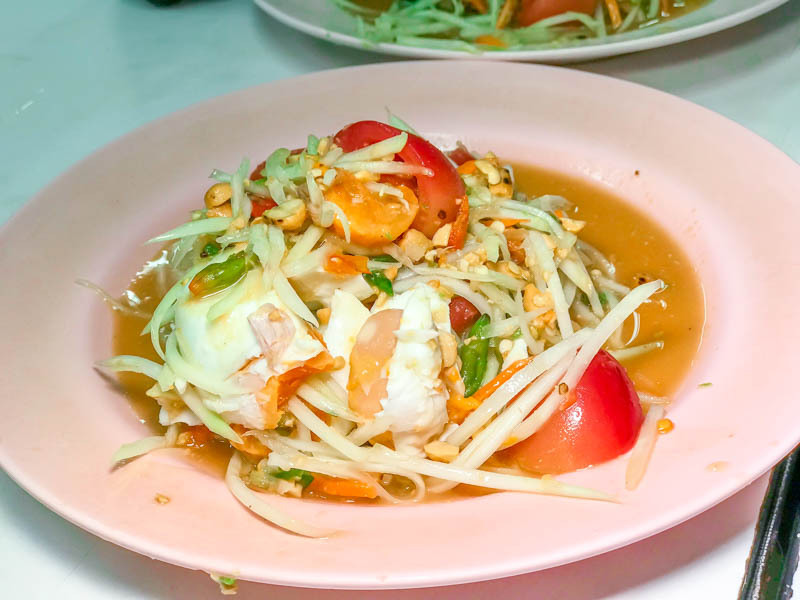 We observed that many guys really love this dish as an alternative to the usual Som Tum flavours. Do note that the Thai people do not consider this a traditional Som Tum dish though! I am a meat lover and the actual reason why I love eating here is to have the amazing Grilled Pork Neck (THB60, approx. S$2.50) along with the Som Tum. 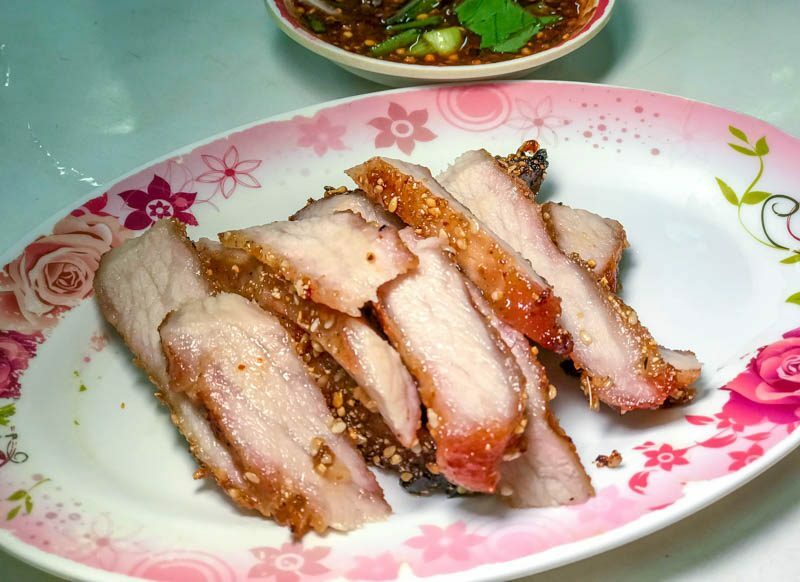 Named Kor Moo Yang in Thai, slabs of juicy pork neck are marinated and grilled to perfection, sliced thinly and served. It is a sinfully delicious dish that will make you want more with each bite. Remember to dip the meat in the special tamarind sauce and eat it with some sticky rice. It is so addictive that customers are always gobbling up plates of this grilled meat. To complete the meal, order the Kai Todd (THB55, approx. S$2) that packs a great crispy crunch with every bite. 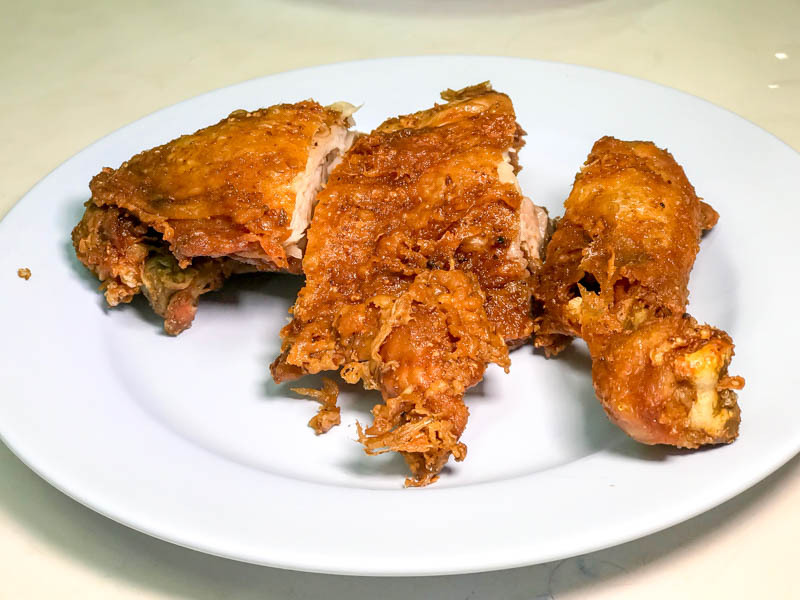 Freshly fried, and always snapped up by the endless flow of customers, it is a must-have for all fried chicken lovers. Eat it with some of the spicy salad sauce that comes with it for an added Thai twist. 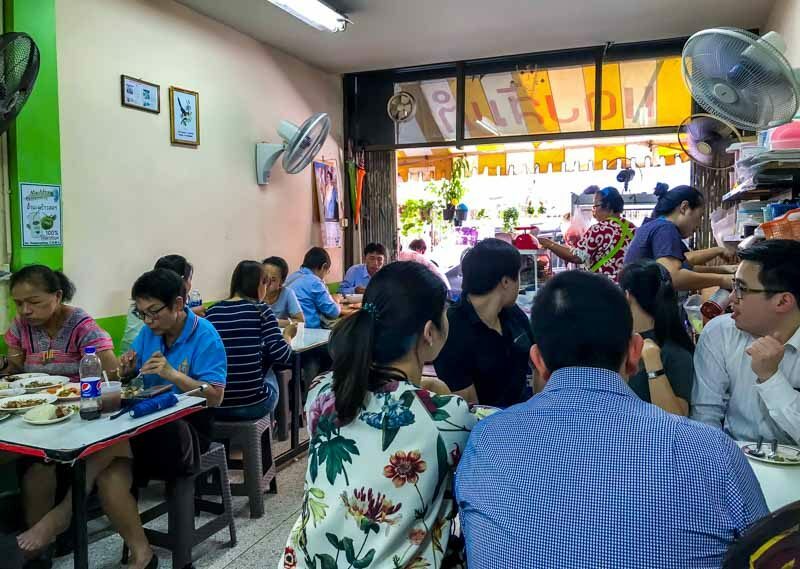 This Som Tum shop gets really crowded during lunch, and it mainly caters to locals. As such, you will not find English words on its menu, but that’s what this article is for! If you’re looking for a Som Tum place with authentic local vibes, Som Tum Jae Daeng is the place for you.